Some ballpoints are a pleasure to write with: writing with, say, a Parker T-Ball Jotter is a breeze. But I understand where Mr. Willis is, as they say, coming from. The clip begins at 47:33. Achilles’s speech shows his clear rejection of his community’s belief in the value of tīme . . . . [The paragraph then develops this idea.] But Achilles also rejects his community’s belief in kleos. Achilles also rejects a belief in kleos. Many of my students tell me that they’ve been taught to organize their paragraphs in this way. Thus the end-of-paragraph transition is both a bug and a feature. Where it comes from, I don’t know. I’ve never seen a text that teaches it. I try to counter this mistaken paragraph strategy by pointing to the work of professional writers (whose paragraphs don’t work in this way) and by appealing to logic: the best place to present a new idea is in a . . . yes, in a new paragraph. But I don’t want students to go just by what I say — that tends to reinforce a suspicion that writing instruction is a matter of quirks and whims, one instructor wanting things one way and another wanting the opposite. And I’ve never found an authoritative source that addresses the end-of-paragraph transition clearly. Begin a paragraph with a topic sentence. Don’t end the preceding paragraph with what should be the next paragraph’s topic sentence. Granted, this advice appears in a text for lawyers. But four of the five quoted passages on paragraph construction that accompany this advice come from non-lawerly sources (William Zinsser and others). Not all writing requires explicit statements of main ideas, and such statements need not appear (as Garner acknowledges) at the starts of paragraphs. No. 16 best applies to writing that argues and expounds — the kind of writing that college students do (or should be doing) all the time, with new ideas in new paragraphs. I bought my first Ellington LP when I was in college: This One’s for Blanton, piano-bass duets with Ray Brown. I had read that Ellington’s piano style had influenced Thelonious Monk. That made me curious. But where should you start? (And you should, really.) The answer, I think, is still The Great Paris Concert, now a bunch of files, and a ridiculously good buy from the usual sources. 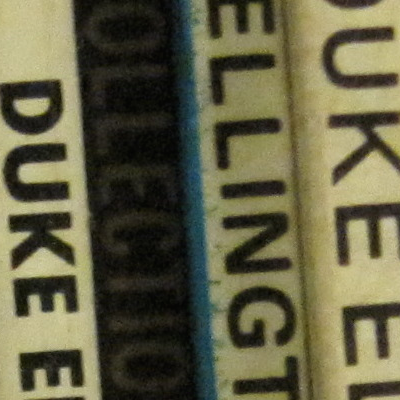 Ellington plays all day today at WKCR. I thought of Robert Johnson’s “Hellhound on My Trail”: “I got to keep moving, I got to keep moving.” I thought of “Whoopsie!” and “Oops!” I thought of putting this thought in two heads. But I like better what Elaine suggested. Thanks, Elaine, for your suggestion and for the use of your humormeter. Someone is having fun with Wikipedia. I think. It’s now three days straight. But I’m not planning to make a habit of it. Not. I can stop at any time. Nick Spitzer’s radio program American Routes has two hours of and with Van Dyke Parks and Tom McDermott. Listen here: Creole Eyes and Classical Ears: Van Dyke Parks and Tom McDermott. 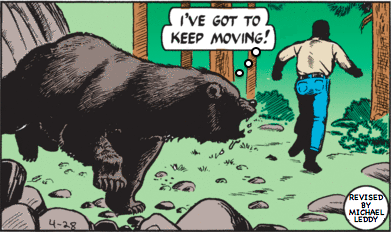 I don’t plan to make a habit of revising Mark Trail strips, but then no one plans to acquire a habit. Rushed by an bear, Mark Trail picks up a large branch and stuns the enraged creature. “It worked,” Mark tells himself. 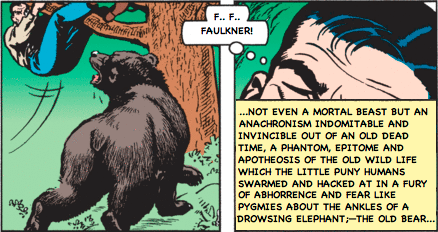 “The bear is stunned!” I couldn’t resist revising the aftermath. 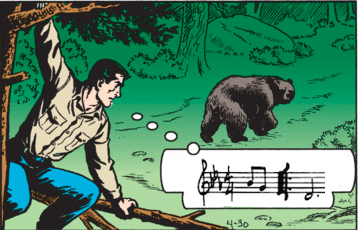 Even Mark Trail deserves a break once in a while. My parents are celebrating the sixtieth wedding anniversary today. What a great-looking couple, then and now. I am now ten years older than my parents’ combined ages when they married. Younger readers, take caution: these things become inexpressibly strange to think about as you get older. Or at least they do for me. This episode must rank among the greatest Naked City episodes. Diahann Carroll’s performance as teacher Ruby Jay won her an Emmy. There’s an interview with her at the Archive of American Television’s Naked City page. Also in this episode: John Megna, who would soon appear as Dill in To Kill a Mockingbird. Two great actors. That meeting had me literally climbing the walls. That meeting had me figuratively climbing the walls. That meeting had me climbing the walls. My friend Aldo Carrasco used literally with impunity. He must have gotten special permission. “Literally unbelievable” was a signature Aldo phrase. Musician can be a tricky word. The Oxford English Dictionary gives the meanings “a person talented in the art of music” and “a person who performs music, esp. on a musical instrument; a professional performer of music.” So the word does tilt in the direction of those who play instruments. But ask someone in music the innocent question “What do you play?” and a someone who sings may be slightly offended. “My voice is my instrument” might be the chilly response. Vocalist makes me think of a guy or gal sitting on a bandstand circa 1940. That guy or gal was a singer, probably a fine musician. Vocalist seems especially odd when applied to classical music. Elly Ameling, Janet Baker, Beniamino Gigli: vocalists? No, singers. Or a soprano, a mezzo-soprano, and a tenor. Did you notice what was going on in the first two seconds? Those are the ukulele chords at the end of The Beatles’ “Free as a Bird,” played a half-step down. That tag also appears at the end of the Formby favorite “Mr. Wu’s a Window Cleaner Now” (in the proper key of D: B♭7, A7, D). I knew that the end of “Free as a Bird” was a tip of the hat to Formby, but I didn’t know that the hat fit so perfectly. It’s not a Formby sample at the end of “Free as a Bird”; by all accounts, it’s another George, Harrison, Formby fan and devoted ukuleleist, who plays those chords. According to the George Formby Appreciation Society, the man on stage at the end of the “Free as a Bird” video is Formbyite Alan Randall. And as every Beatles fan should already know, the voice at the end of “Free as a Bird” that sounds as if it’s saying “Made by John Lennon” is John’s voice in reverse, speaking the Formby catchphrase “Turned out nice again.” That phrase is the title of a Formby film. And “It’s Turned Out Nice Again” is a Formby song. Here’s a page with a link to George Harrison playing and singing a Formby song. And here’s George at home, playing Howard Dietz and Arthur Schwartz’s “A Shine on Your Shoes,” ending with the tag. And here’s a clip of George and Jeff Lynne on banjo-ukes. The tag’s at 2:54. Kissing for fun is like playing with a beautiful candle in a roomful of dynamite! And it’s like any other beautiful thing — when it ceases to be rare, it loses its value and much of its beauty. I really think it’s better to amuse ourselves in some other way. For your own future enjoyment I say go bowling, or to a basketball game, or watch a good TV program (like the Pat Boone Chevy show! ), at least for a while. I would like to imagine a lost original for ’Twixt Twelve and Twenty, the print equivalent of “Tutti Frutti”: Little Richard Talks to Teenagers. That would be quite a book. (of a relationship) formerly of great importance but now of little or no importance: their relationship is strictly plutonic. Elaine hit on the word and together we worked out the meaning. Cooper-Hewitt’s Object of the Day yesterday: a 1958 Rolodex. I have still not seen anything similar to this Rolodex-like design. 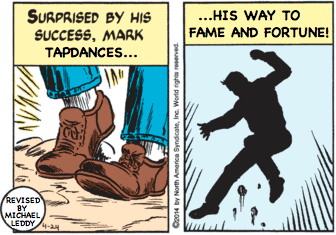 Mark Trail has a new artist: Jack Elrod has passed the ball to longtime assistant James Allen. And Mark is back home after catching a poacher. Mark has been driving about in a jeep, taking in the sights and sounds of Lost Forest. He has been driving since Saturday. 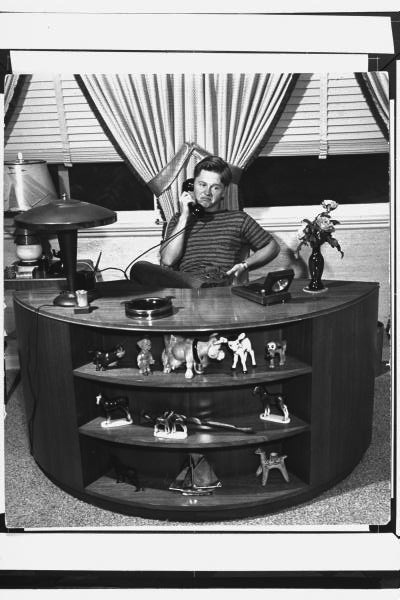 In the panel above, he is talking to his wife Cherry. 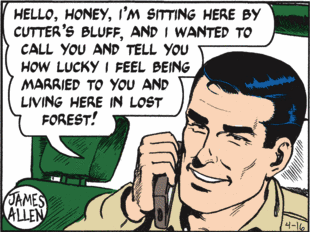 As any Mark Trail reader knows, Mark’s relationship with Cherry is non-existent. 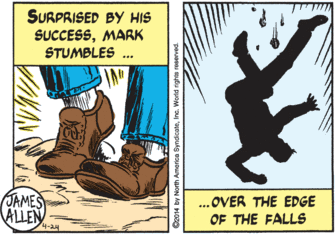 The strip’s pattern: Mark heads out on an adventure, comes home, sits at the table with his family, and heads out again. It’s like the Odyssey without book 23. But the dialogue in the panel above marks a new intimacy between the Trails. What better way to show affection than to call as you drive alone and aimlessly, avoiding your partner’s company? Is James Allen having fun with his own strip? I think it’s too early to tell. The [Word of the Day] page and email are peppered with banner ads for the DVD release — a more typical form of web advertising — but the text itself reads like “sponsored content,” ads meant to look and feel like the publishers’ original content. Yes, Merriam-Webster, Inc. is a business. But it never occurred to me that the Word of the Day was promoting anything other than Merriam-Webster itself. I miss so much by using an ad-blocking extension in my browser. 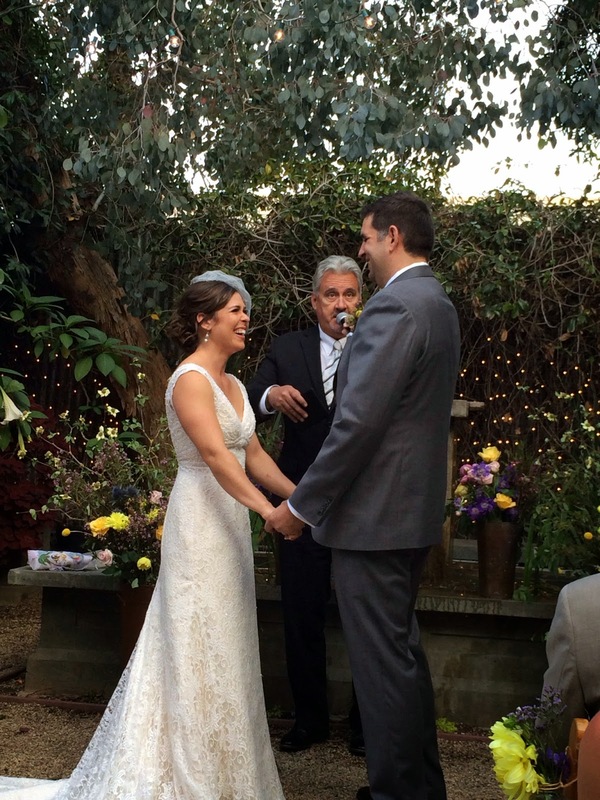 It was a beautiful wedding. Elaine has two more pictures. Merriam-Webster’s Word of the Day today is madeleine. It is a word that brings back memories, memories of September 26, 2006, when madeleine was also the Word of the Day. 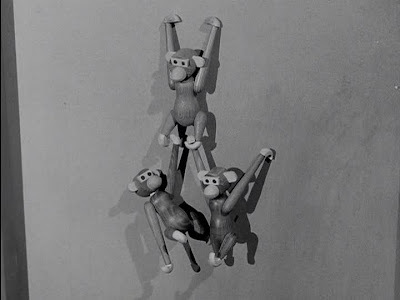 Detective Frank Arcaro (Harry Bellaver) has decorated a wall of the detectives’ room with these monkeys. When Lieutenant Mike Parker (Horace McMahon) looks askance at that wall, Frank explains that the monkeys came from Coney Island. Frank went there with Ruth Curran (a newly retired city employee). Frank, who still lives with his mother (strong Marty-esque overtones), is dating. I would say that this Naked City episode is an unusual one, but every episode in this series is in some way singular. Seeing these monkeys gave me a jolt: I had such a monkey in childhood. I wish I knew where he or she came from, and I wish I knew where he or she went. It’s a very big day for our two families. 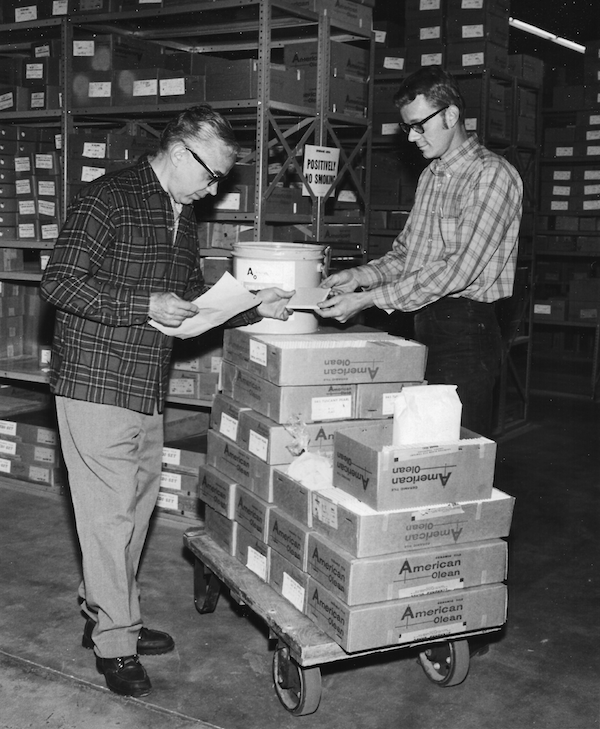 That‘s my dad on the left, Jim Leddy, Leddy Ceramic Tile, in a promotional photograph for American Olean Tile. On the back, the rubber-stamped names and addresses of the photographer and American Olean. No one in my family remembers the circumstances that led to this photo. My guess is that it’s from the 1970s. I found it at the back of a file drawer in my office, stashed with various newspaper clippings and postcards. I had no idea it was there. 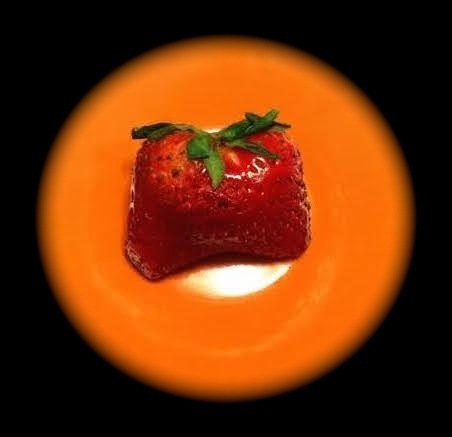 It’s like two, two, two strawberries in one. The photograph is all that’s left of it. Are such strawberries common? Elaine and I are making some preparations for a wedding — not ours, our daughter’s — and we’re feeling a tad giddy. Or more than a tad. We’re wired. Microsoft: “As of April 8, 2014, support and updates for Windows XP are no longer available.” But it’s hard to think that the date marks the end of an era. As Marco Arment observes, “People just don’t care to upgrade.” XP users gonna use. XP is the best version of Windows I ever used: it was the arrival of Vista that prompted me to switch to OS X when I bought a new laptop in 2007. I just looked at my blog stats: Windows 7 is in first place, with 31% of visits to this blog. In second place, OS X, with 24.3%. Windows 8.1 and 8 users together account 7.2% of visits. XP users account for 6.1% of visits. Those two percentages say something about Microsoft’s troubles: the thirteen-year-old Windows accounts for almost any many visits as the most recent versions. Other versions of Windows — Vista, 2003, 2000, 98, and NT — account for 2.3% of visits. 8.1, 8, 7, Vista, XP, 2003, 2000, 98, NT: do you notice the version of Windows missing from this sequence? Hint: It was later than 98 and earlier than XP. By using the words it already contains. 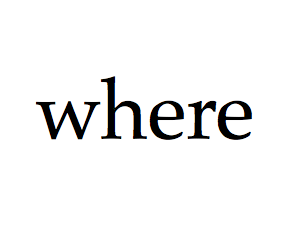 Verlyn Klinkenborg, Several Short Sentences About Writing (New York: Alfred A. Knopf, 2012). I just quoted these lines in a reply to a thoughtful question about a troublesome sentence. I’m high on (“enthusiastically in approval or support of”) Klinkenborg’s book. My students like it too. It’s one of the best books I’ve chosen for teaching a writing course. Several years ago students began to ask me a question I’d never heard and didn’t know how to answer: “How many points is this worth?” I had, and still have, no good answer. I have no points. My first attempt at an answer — “Well, everything’s out of 100” — sent one asker into a panic. And then I realized what was going on: an increasing number of college classes are organized by points, five for this assignment, ten for that. The work of the semester adds up to several hundred points. So a grade of 100 attached to a measly page-long piece of writing appeared to be cause for concern. My next attempt at an answer was to point out (as my syllabus already pointed out) that all the writing in a course added up to, say, 60% of the semester grade. So an assignment of, say, four pages, about 20% of the writing, would equal 12% of the semester grade. But that isn’t entirely accurate (I would add), because the best writing grade would count more heavily. Thus the essay would end up counting for more or less than 12%. As they say on Facebook, it’s complicated. And “12% of the semester grade” isn’t likely to signify much to anyone. My most recent attempt at an answer is too simple but more satisfying: I average everything to make the writing part of the grade. The details are on the syllabus: writing is 60% of the semester grade, with participation and a final examination counting as 20% each. End of story. But not the end of my dismay about “points,” a system that fosters unhealthy attitudes toward coursework among students. A point system encourages academic gamesmanship — choosing opportunities for maximal and minimal effort. Students make such choices all the time: study harder for this exam, let this quiz go. But attaching a number to each bit of work explicitly demeans daily incremental effort, the effort that shows itself in quizzes and short assignments (and makes it more likely that a student will do well with larger assignments and examinations). Losing five points here, five points there — it’s too easy for a student to think, So what? I’ll ace the big test and win. Thus a point system demeans the work of learning, which is a matter not of picking targets and acing tests but of engaging a body of knowledge and practice, patiently, over time. How many points are, say, a musician’s daily scales and etudes worth? All of them. Richard McLeese at Music Clip of the Day sent me the news that Columbia University’s WKCR is playing Billie Holiday all day. Holiday was born on April 7, 1915. If you’re in a workplace minus iTunes, the free app VLC can stream WKCR. Mickey Rooney’s came up three times in our household this weekend. We heard a Jeopardy contestant confuse Mickey with Andy Rooney. We talked about a New Yorker article that mentioned Norman Lear’s interest in Rooney for the role of Archie Bunker in All in the Family. Too risky, Rooney thought. And that led us to consider Mr. Yunioshi of Breakfast at Tiffany’s. I like musicals just fine. But I remember Rooney more for The Comedian (1957), Requiem for a Heavyweight (1962), and his strange turn in the Naked City episode “Ooftus Goofus” (1961). I’ve been using the Warner’s Super 8 to remove snow from a car for at least thirty-four years. This brush has traveled with me from New Jersey to Massachusetts to Illinois, always in the back of a car. The brush was already old when I carried it off from the family manse. How old? Old. The leather loop that was once attached to the handle is long gone. What I like best about this brush: its name and logo. I like the very idea of a brush bearing a name. And such a name. And such a design. 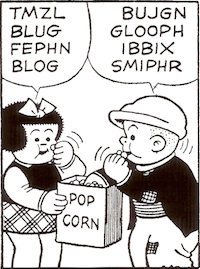 If my name were Warner, I’d trademark it and write it that way too. “Never met a wheel I didn't want to reinvent”: designer and developer Shaun Inman, creator of the free Mac app Day-O. There is great value in reinventing wheels. And Day-O is a nifty app. As Inman says, it “doesn’t do much of anything ” — just as it should do, or not do. A spelling of the future: my term for a misspelling so strange that it must be traveling backward in time to give us a foretaste of our language’s evolution. Because language is always evolving. Is it okay to where khaki shorts in a classroom? No. Not ever. Sociologist Zygmunt Bauman is defending himself against charges of plagiarism, saying that “obedience to technical procedural rules of quotations” has nothing to do with the quality of scholarship. Bauman might better defend himself by taking his cue from Uncle Leo. 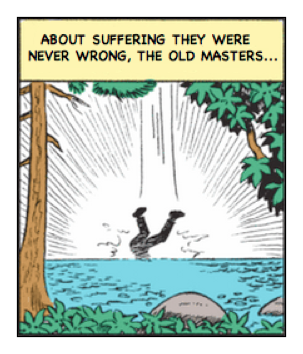 The terrible events in the news yesterday make it a strange time to be teaching Sophocles’s Ajax. There is a widespread belief that humanities PhDs have limited job prospects. The story goes that since tenure-track professorships are increasingly being replaced by contingent faculty, the vast majority of English and history PhDs now roam the earth as poorly-paid adjuncts or, if they leave academia, as baristas and bookstore cashiers. What Segran fails to acknowledge is that the very telos of doctoral study in the humanities is a life of teaching and scholarship on the tenure-track. That’s what grad school is supposed to be for. And while it may be the case that PhDs are hired outside academia for, as one of Segran’s interviewees says, “their process skills: the ability to do excellent research, to write, to make cogent arguments,” it is far from clear that doctoral study is necessary or even practical in developing such skills. Five or seven or ten years in training to learn how to make a cogent argument? No. If graduate programs are producing more PhDs than will ever be hired for tenure-track positions (given current institutional priorities in American higher education), the prospect of seeking a PhD looks ever more dubious. That some degree-holders have been able to find worthwhile employment outside academia (usually “through their own networks, without the support of their departments,” Segran says) does little to make graduate study in the humanities more appealing. Imagine going to medical school when the odds are slim that you’ll ever practice. Ladies and gentlemen, start your networks. 3:13 p.m.: To the reader who tweeted that the words “the very telos of doctoral study in the humanities is a life of teaching and scholarship on the tenure-track” sound like “bitter, dusty tweed” and make her “want to vomit”: please, read those words in context and not in the form of someone else’s tweet. The words form not a sentence but part of a sentence. And the sentence expresses a sad truth that Segran doesn’t acknowledge: that doctoral study in the humanities prepares students for a future that many of them will never attain. There’s nothing of tweed (or pipesmoke) in my words: rather, there’s a recognition that “the profession” is for many doctoral students unattainable. None of what I wrote suggests that PhDs should not seek work outside academia. But I think that a doctorate is hardly a necessary preparation for being able to reason and write well. That’s Matthew Butterick writing, from the book-as-website Butterick’s Practical Typography. You may already know Butterick’s name from Typography for Lawyers. This sales ploy is beyond tasteless. It is in truth obscene: “offensive to moral principles; repugnant” (New Oxford American Dictionary). 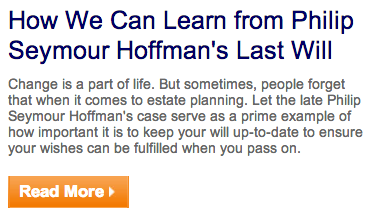 Shame on LegalZoom for seizing upon Hoffman’s terrible end as a way to market its services. LegalZoom offers no way to explain the choice to unsubscribe from its e-mails. If you call to give feedback (1-800-773-0888), you’ll be directed to a “Contact us” page. It’s possible to leave a written message there. 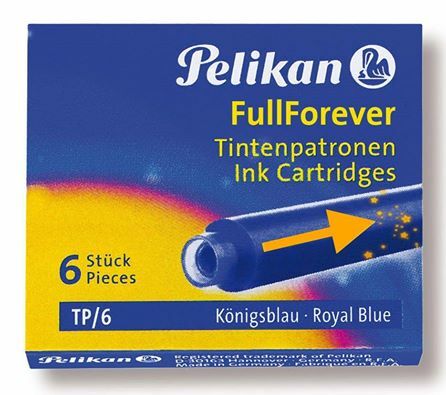 My favorite pen is a Pelikan fountain pen. I start any piece of writing of any length with that pen. I can’t wait for this ink to appear in bottled form.